Cut the onion into thin slices. Melt butter in a large skillet over medium-high heat. Add the onion and sprinkle with sugar, a touch of salt and ground black pepper to taste. Stir occasionally, until the onion is soft and golden (about 10 minutes). Remove from the heat and stir in corned beef, Worcestershire sauce and mustard. 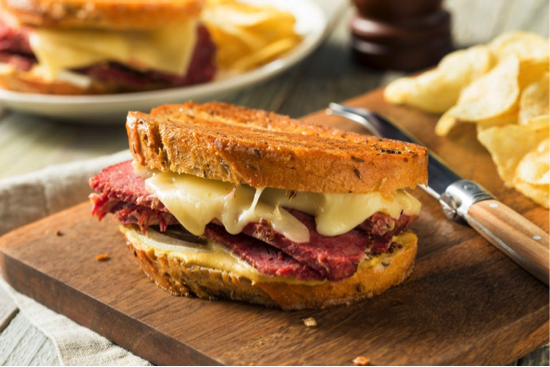 Divide half of the cheese between two bread slices, top with the corned beef mixture, the remaining cheese and two bread slices. Melt the remaining 1 tablespoon of butter in a large skillet over medium-heat. Add the sandwiches and cook, turning once, pressing occasionally with a spatula, until the bread is toasted on both sides and the cheese melts.